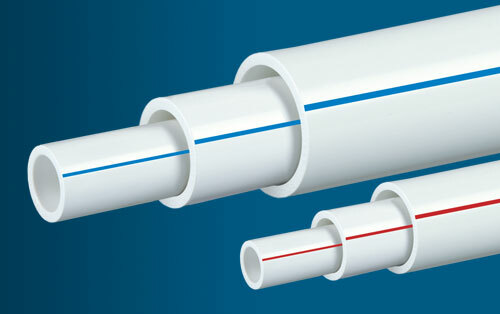 UPVC Pipes stand for Un-Plasticized Polyvinyl Chloride Pipe and is popularly used for plumbing in the housing industry and house water connection. DHY Trading Corporation is one of the prominent UPVC Pipes Manufacturers in Mumbai, India that you can get in touch with, for buying different types of pipes. These are manufactured by using environment-friendly virgin UPVC compound, which is lead-free and doesn’t affect water quality. UPVC Pipes are resistant to chemical erosion and have smoother inner walls to ensure proper water flow, which make it working in challenging temperatures and operating pressures. They are mostly used in sewage lines and exterior drainage pipes due to their strong material, durability, high strength and longevity. These are ideal substitute for the galvanised iron pipe system for cold water applications. We are engaged in serving the best quality Plastic Pipes after testing it on different parameters, thus, we have successfully gained the position among the leading UPVC Pipe Suppliers and Exporters. You simply need to share your requirements with our executives, and we promise to meet it before the deadlines. So, call now or leave an enquiry directly from the website.